Las Vegas caters to high-rollers, and there are plenty of suite options along The Strip. Today, TPG Contributor Peter Rothbart highlights several opportunities for award travelers to experience Sin City in style. Las Vegas offers an incredibly wide range of hotel options. On an average night, you can probably find rooms for anywhere from $20 to $20,000, sometimes separated by only a few blocks. Because prices vary so dramatically and because partnerships with traditional loyalty programs have only recently caught on, Vegas hotels generally aren’t great for redeeming points and miles. However, there are options for award travelers looking to make a splash. In this post, I’ll explore several properties on the Vegas Strip that let you use travel rewards to book suites. Although these award redemptions don’t offer top value, they do offer a premium experience at a (usually) reasonable price. The Signature is an all-suite hotel that occupies three towers about a quarter mile off the Strip and is accessible through a network of walkways at the back of MGM Grand. The Signature is a non-gaming and non-smoking property, so the ambiance is a bit more serene than at other venues closer to the action. It’s a good option for families or those who just want a quieter stay. The basic Deluxe Suite is 550 square feet, but it feels larger. It includes a small kitchenette with a refrigerator, stove, microwave and a few other small appliances, a balcony and a spacious bathroom with separate rain shower and whirlpool tub. Rates start around $99 per night (plus a $32.48 daily resort fee), but often exceed $200 on weekends. Thanks to the partnership between Hyatt and MGM, you can book the Deluxe Suite at a fixed rate of 20,000 Gold Passport points per night, equivalent to a Category 5 property. Although Hyatt doesn’t have a clear policy about resort fees on award stays, most reports indicate that you won’t be charged. Redeeming points is not a good value when prices are low, but I found award availability on weekend nights that were going for $239. Once you factor in the resort fee, you’d be getting about 1.35 cents per point. The Signature won’t make the list of awesome Hyatt awards, and it definitely wouldn’t be a good use of your free night certificates. However, if you redeem points to visit when rates are high, you’ll get a decent return and a comfortable stay. The Cromwell’s spectacular location on the northeast corner of Las Vegas Boulevard and Flamingo Road is part of what makes it one of my favorite hotels on The Strip. With only 188 rooms, the hotel manages to offer the swank and splendor of Sin City with somewhat of a boutique feel. The partnership between SPG and Total Rewards (the loyalty program of Caesars Entertainment) enables Starwood members to earn and redeem points, as well as enjoy certain elite benefits at select Caesars properties. The redemption value is pretty poor, as you’ll only get about 1.1 cents per point — much less than TPG’s most recent valuation of Starpoints at 2.5 cents apiece. However, you get a quality experience. The Gallery Suite offers more than 1,400 square feet of luxurious living space. The living room features a well-stocked bar and two large TVs for entertaining, while the bedroom and master bath offer a Simmons Pillow Top King bed, a stand-alone soaking tub and a rain/steam shower. The similarly priced Boulevard Suite is smaller, but a bit more glamorous and features great views of the Center Strip. Rates for either suite start around $780 or 67,000 points per night, so while this won’t make the list of great ways to redeem Starpoints, it’s a good option to keep cash in your pocket if you want a suite in a prime Las Vegas location. The Palazzo and Venetian are two more all-suite properties with rooms starting at 720 and 650 square feet, respectively. Although the suites available with points are basically just super-sized standard rooms, they’re exceptionally comfortable and are well worth a look. The basic Luxury Suite features a sizable sunken living area with separate work, dining and sitting spaces. Some rooms come with a full-sized sofa sleeper in case you have guests. Bathrooms are decked out in marble tile and come with double-sink vanities, Roman tubs and separate glass-enclosed showers. 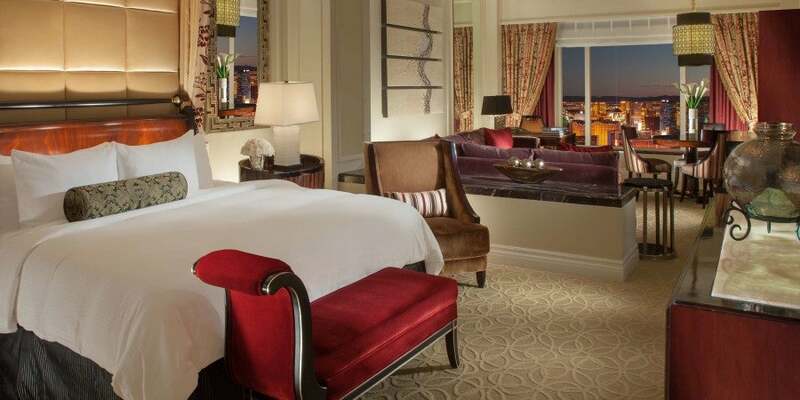 You can book Luxury Suites at the Palazzo and Venetian for a flat rate of 50,000 IHG Rewards points per night, which corresponds to IHG’s top tier. The redemption value fluctuates with the cash rate: These suites can often be had for less than $200/night, but you can find award availability on nights where the cash price is as high as $400. The IHG website indicates that the $29 daily resort fee is not included, but anecdotal evidence (including my own personal experience) is that you won’t have to pay resort fees on top of your award. That means you could get about 0.86 cents per point, which is a pretty good value for IHG Rewards. Elara is the first of two Hilton Honors properties on this list. Like the Signature at MGM Grand, it’s a non-smoking and non-gaming establishment, so it’s a good option for families. It also boasts a sneakily excellent location, since it’s removed enough from the Strip to be fairly quiet, but a short walk through the Miracle Mile and past Planet Hollywood puts you in the middle of the action. Elara is somewhat unique on this list, since you can use points to book everything from the smaller Junior Suites to the larger Four-Bedroom Suites, which offer 2,300 square feet of living space and accommodate up to 10 people. These rooms aren’t particularly glamorous, but they are well equipped, as most of them come with a full kitchen and self-laundry. They’re also very comfortable, with large spa-sized jet tubs, multiple flat-panel TVs and plenty of living space. I think the best value is the one-bedroom suites, which measure almost 900 square feet and start around $165 or 54,000 points per night. That’s a return of about 0.3 cents per point. At peak times, those rates can skyrocket to more than $400 and 180,000 points per night, for a return of closer to 0.2 cents per point. The redemption value isn’t good, and I definitely wouldn’t use free night certificates from the Citi Hilton HHonors Reserve Card. However, if you have extra Hilton points and want to save cash, I think Elara offers a great product. The SLS Las Vegas is part of Hilton’s Curio Collection, so you can use HHonors points to book both regular rooms and select suites. These awards cover the $29 daily resort fee, and you can actually get decent redemption value here. With the resort fee, rates start around $280 or just more than 68,000 HHonors points, for a return of close to 0.4 cents per points. The bad news is that the suites available with points are pretty small, and frankly are overpriced. The Lux Signature King suite shown above is just 490 square feet — barely larger than some standard rooms in the area. It’s well appointed, with crisp decorations and a few mildly scandalous features, like a mirror over the bed and a window from the bedroom into the shower. But considering that the same number of HHonors points could get you a much larger suite at Elara or Tropicana, I don’t think this redemption makes sense. If you’re determined to stay at the SLS, you’re probably better off redeeming for a Story Superior room. It’s tiny at 325 square feet, but rates start around $90 with the resort fee or 16,000 points per night, for a better value of more than 0.5 cents per point. When you imagine a true luxury suite in Vegas, it probably looks something like the Anthology Villas at Caesars Palace. These high-end residences occupy various parts of the Octavius and Forum Towers, and have entertained a diverse cast of celebrities, dignitaries and multi-billionaires. Although they don’t fall under the purview of any traditional loyalty programs, I included them to spur the imagination and get you thinking about award travel possibilities. These suites come with all the bells and whistles. For example, the Marcus Aurelius Villa (also known as the Spanish Villa) offers 9,500 square feet of indoor and outdoor space, including massive living and dining rooms, a private theater, indoor and outdoor Jacuzzis, a grand piano and multiple fireplaces. You’ll get a private secured entrance, 24-hour butler service, Rolls Royce or Range Rover car service (even as far as Los Angeles) and staff on hand to take care of pretty much anything you need. The lounge in the Marcus Aurelius Villa comes with a full-sized pool table, a well-stocked bar and a bartender to boot! This level of luxury doesn’t come cheap, as the Marcus Aurelius and several other villas start at $25,000 per night. Although hotel points won’t get you through the door, you could (in theory) use fixed-value rewards from the Barclaycard Arrival Plus World Elite Mastercard, Capital One Venture Rewards Credit Card, or another similar option. Those miles are worth 1 cent apiece, so you’d only need 2.5 million of them for a free night. Even though you earn 2 miles per dollar spent on those cards, it would probably take you a long time to accumulate enough for such a pricey redemption. However, if you find a reasonable way to divide the bill, you could invite 60 or so of your friends to join you for an epic party, with a sign-up bonus from one of these cards serving as the cost of admission. If you do it, count me in! Vegas is one destination where I really appreciate having a comfortable haven from the heat and mayhem. Even though these suites don’t offer great redemption value, they can be worthwhile if you place a premium on having more space and amenities. If you’ve used points to stay in these (or other) suites in Las Vegas, please share your thoughts and experiences in the comments below!